5′ Animated Zombie with Shaking Head – Awesome Zombie Halloween Costume! Please Note: Products are designed and rated for use in the United States using 120 volt current. With or without a transformer, this product is not recommended for use outside the US. Animated Zombie stands approximately 5′ high and includes attached base. Prop is sound and motion activated. Simply make a noise or walk by to activate. Includes UL Listed AC Adapter with a black power cord that measures approximately 4.5′ long. Collapses for easy storage. Head shakes and body moves from side to side as prop speaks. 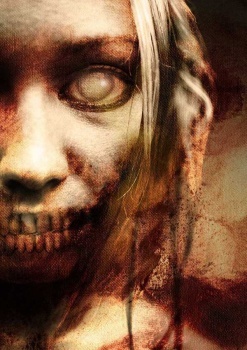 Zombie says the following phrases: "Welcome, lovely evening for a fright, isn’t it? "; "I don’t believe we’ve met … at least not on this side of the grave! "; "Ahhh, more guests – please leave your body at the door and do come in! ".